When we last left Morgan Stanley, the company was taking all manner of abuse for botching the biggest IPO of the millennium. Alas, that turns out to be the least of its problems. Far more pressing is the fact that Moody’s may be on the verge of massively downgrading Morgan Stanley’s bond rating, which could cost the company billions of dollars (perhaps tens of billions) in collateral and increased borrowing costs. Then yesterday’s Financial Times brought even worse news. 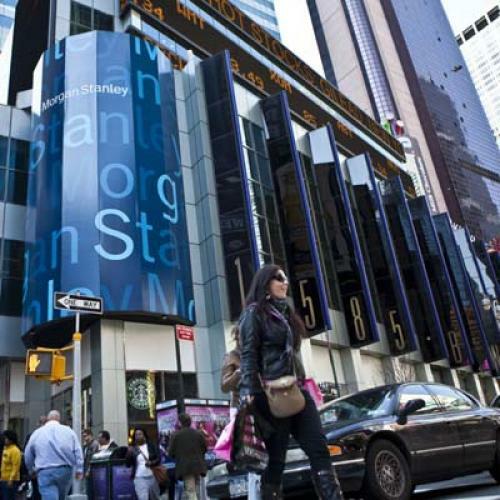 To help save some cash in the event of a downgrade, Morgan Stanley was hoping to park a big portion of its $52 trillion derivatives portfolio inside its bank subsidiary—the portion of the company that functions as an old-fashioned loan-maker, not a hedge fund or investment bank. The reason for doing this is that it would lower borrowing costs that would otherwise shoot up when its credit rating dropped. Why? Because being a bank means you have lots of customer deposits, most of them insured by the federal government, and that you have access to really cheap loans from the Federal Reserve. If, say, you suddenly took a multi-billion-dollar bath on your derivatives bets, Uncle Sam would be there to absorb the losses, or at least help you manage them, and the bondholders who'd loaned you money wouldn’t feel the pinch. And, of course, the bondholders know that in advance, which is why they're likely to loan you money at reasonable rates in the first place. Hence the low borrowing costs. Sounds like an ingenious plan—just have the taxpayers subsidize the riskiest part of your operation! And, indeed, it is. As the FT notes, most of Morgan’s Stanley’s American competitors, chief among them Goldman Sachs, already house something like 90 percent of their derivative book in their bank subsidiaries (versus a mere 3 percent for Morgan Stanley today). Man—what’s a giant Wall Street firm have to do to catch a break these days! In all seriousness, I’ve been pretty hard on Dodd-Frank these past two years ago. But if all it does is stop these kinds of shenanigans, then there’s clearly something to be said for it. If, on the other hand, the Fed gets its way on this—the Fed being famous for trying to shield bondholders from losses—then it will have proven itself to be a truly worthless piece of legislation. I’m not holding my breath.